3 November. A new mausoleum has been found in Rome along the ancient via Tiburtina dating to the 1st-4th centuries AD. No mention of skeletons, though. 9 November. Published this month is a Roman-era "giant." The man suffered from a pituitary disorder that made him stand about 6ft 8in (202 cm) tall. He was found in a necropolis at Fidenae (just outside Rome) in 1991 and dates back to the 3rd century AD. There's a variety of coverage of this publication, but see the story at National Geographic and a copy of the paper (while it lasts) is at Academia.edu. 26 November. Researchers at the Catholic University of Rome have sequenced DNA from the skeleton of a girl found at Cosa (in Tuscany), dating to the 1st century BC. Based on the presence of the HLA gene variants in her genome, as well as the osteological analysis of her skeleton, which revealed surprising evidence of malnutrition given her high-status burial, that she may have had celiac disease. This is a cool disease-ecology-type finding, as celiac disease would have been difficult to deal with in the wheat-heavy Roman world. I haven't read the article yet, which is in the World Journal of Gastroenterology, but I'm surprised this hasn't been picked up more widely. It's a really interesting study, although I can't find the article in the WJG online site. 29 November. Several Greco-Roman-era graves were found on the island of Lipari, one of the Aeolian islands in the Tyrrhenian Sea off the coast of Sicily. Lipari has long been a strategically important harbor, from ancient through relatively modern times. These remains seem to be pre-Empire (5th-2nd centuries BC, I think?). There are some interviews with excavators (in Italian) here. 4 November. 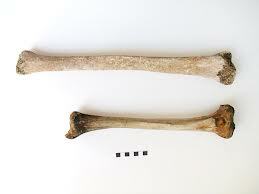 A late Iron Age grave of a supposed warrior and his wife has been found in Sremska Mitrovica, Serbia. There are some very interesting grave goods, including a "killed" knife or spearhead. It's thought to be a double cremation burial, although the report doesn't note if there were any human remains found. 5 November. The magazine Popular Archaeology carries a piece this month on new excavations at Petra in Jordan. The skeletal material, dating to the 1st century BC to the 1st century AD, is being analyzed by my colleague Megan Perry at ECU. 17 November. Remains dating to the Roman and Iron Ages have been found in Norfolk, England, including some cremation burials and human bones. The remains were found during road construction. 17 November. Over 40 burials and four cremations were uncovered at Cirencester, England, dating to the early Roman period. Interestingly, there was a child's inhumation with pottery flagon dating to 70-120 AD. Archaeologists are excited because inhumation burials were not common practice until the later Roman period; yet I thought that children were often a different case, as they were quite often inhumed (in Rome, anyway), even in times when cremation was the norm for adults. These tombs join 46 cremations, 6 burials, and 1 tombstone found at the same site in the 1960s, all dating to the 1st-3rd centuries AD. Very interesting cemetery, and I hope there's a publication soon. 18 November. 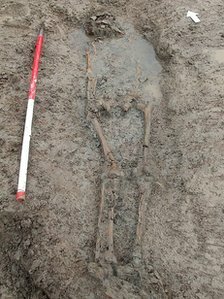 Not to be outdone, Somerset, England, now boasts a Roman cemetery with several human burials, found during water main construction. There was one partially-preserved coffin as well as thousands of shards of pottery, some jewelry, and at least one coin. 28 November. A necropolis with over 100 burials was found in northern Bulgaria near the village of Marten. The oldest burials date to the 5th-4th centuries BC, and several of the skeletons have CVM, a sign of nobility. From the Roman times, there were found wooden coffins, ceramics, and glass. Unclear if any of the Roman-era tombs had skeletal remains or not. 1 November. 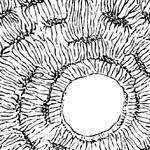 Although discovered in 1959, an aberrant burial from 550-700AD England is detailed in new reports this month. The individual had metal spikes through its shoulders, ankles, and chest (near the heart). 9 November. The American Academy in Rome hosted the one-day symposium "Nutrition and Well-Being in the Roman World: The Evidence from Human Bones." I blogged about my contribution and the other papers here. 10 November. At Edinburgh University, there was a conference on the Roman-era site of Vagnari at the end of October. Current World Archaeology covered some of the highlights, including a mention of the 100+ skeletons that are being studied by my colleague Tracy Prowse at McMaster. 23 November. Mary Beard has an essay in the BBC News Magazine on the human bodies from Pompeii. It's a thought-provoking take on the bodies/plaster casts we tend to stare at in museums and on site at Pompeii, the re-creation of bodies twisted at the moment of death. 3 November. Rumor has it that classicist extraordinaire Mary Beard will be back on TV, but as an advisor to a new sitcom set in ancient Rome called Plebs. 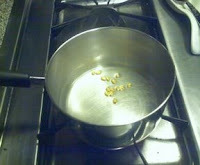 I'm cheesy excited about it, as it'll be like Rome but focused on the commoners. It'll air in the spring. 20 November. I am not the only classicist who watches Bones, apparently, as I spotted this short piece on the blog Eris Quod Sum fact-checking an episode that discusses the process of making steel in ancient Rome. 28 November. 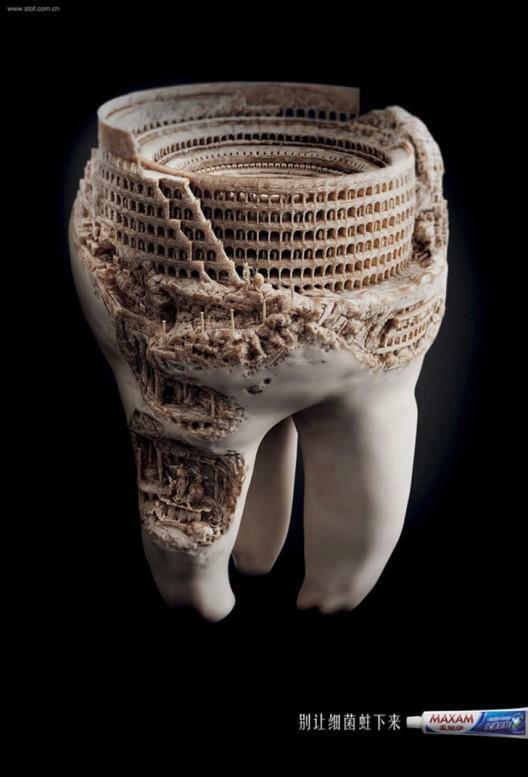 This image of the Roman Colosseum carved into a (fake) tooth made the rounds on Facebook, Twitter, and G+ in the circles I run in. I have no idea what the Chinese(?) characters at the bottom say, but it appears to be a toothpaste ad. Very cool sculpture (or Photoshop job) regardless.